Our Projects 191 tons of Split Beams & Rolled Tees for a new parking deck at an airport. 24" WF at 62.0# Beams Rolled Hardway to approx. 120'-0" diameter. This is 1 of 15 car dealerships that these beams were rolled for. (150) 1/2" x 5 bar segments rolled hardway to approx. 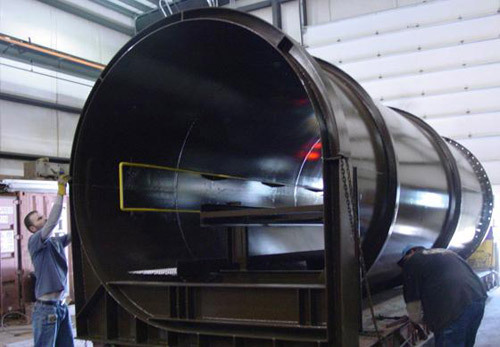 12'-0" diameter used as stiffeners around stainless steel tanks. 95 tons of Rolled Tees, Tubes, Angles, Channels and Beams for a new airport terminal. 10" x 2" x 1/4" Elipitical Rolled Tube Ring located in Chicago, IL. 75 tons of 10" XS Pipe segments rolled to approx. 388'-0" diameter. This was used in the construction of a new coliseum in Puerto Rico. 80 tons of Rolled Angles, Tubes and Beams for a new office building located in Chicago, IL.